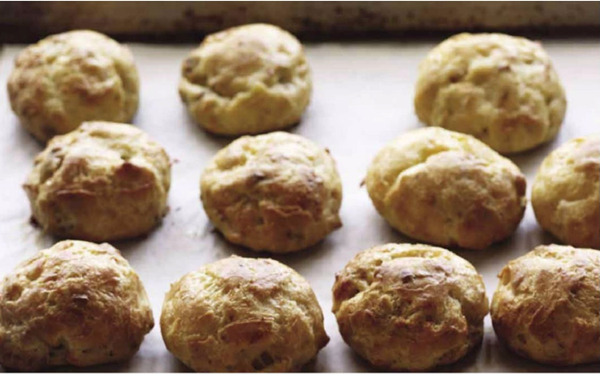 Think we prefer the earlier gougere version. Despite the intro that describes these as sturdier given the change in eggs, ours while appearing well browned and puffy were a bit more squishy and less airy in the middle. Maybe I didn’t dry out the dough enough before dropping them into rounds but I sure had it in the pan for a solid 2-3 minutes it seemed trying to make sure. These were pretty tasty but aren't my favorite gougeres. The flavor was just a little too cheese heavy without anything to lighten it. I did enjoy the Dijon mustard in it. I omitted the walnuts. These were so fast and easy to put together. Not sure if walnuts add anything to them. Maybe I chopped the walnuts too finely. On first bite they tasted salty. I will cut the salt a bit next time. Absolutely adored this. It’s now on the Christmas menu. The first time you make it - please make it as written before you fiddle with it. As written it is easy to execute and the flavors blend wonderfully and the textures are perfect. I had about 100g leftover roasted salmon that had been baked with a Thai-inspired glaze and hoped that it would work in this variation of rillettes. It did. It was delicious! I made a half recipe and replaced the butter with extra mayonnaise. Delicious and addictive. I can’t go without it for long. Everyone I serve it to loves it. With this classic combination of ingredients, I had no doubt that the flavour of this would be good, and it was. There was a fairly high proportion of vegetables to eggs, usually a good thing as far as I'm concerned, but they exuded quite a bit of liquid so the frittata wasn't just moist, it was a little wet. I served it warm; perhaps at room temperature it would have been drier. Also, family thought it needed more cheese. It served 4 as a light supper with a salad. I halved the recipe and made a delicious and extremely quick and easy lunch for husband and myself - he pronounced it “yummy”and “very nice”. I subbed half a red chilli for the jalapeño, added a minced clove of garlic and kept the sriracha on the side rather than adding it to the eggs - I might try adding some to the eggs next time. The 8 mins plus 3 more in the oven was perfect for how I like my eggs. This was simple, quick and delicious. I happened to have some freshly grated Parmigiano-Reggiano on hand (about 1/3 cup) So I added it to the egg mixture. I topped it off with more grated cheese, cherry tomatoes cut in half and fresh thyme sprigs before baking it. This will replace the similar but not as good Denver Omelette recipe I have been making for years. Loved it, will make it again. We loved this. Gallette dough was easy to make and nice and flakey. Bacon and walnuts give it a nice crunch. A repeat. This was really delicious. The ingredient flavours work so well together and the crunchy walnuts are a nice addition. And then, of course, there's Dorie's foolproof galette dough. This is very good, and pretty easy. (Especially if you have a pie shell in the freezer!) I will definitely make again. I didn't have enough chicken broth so added 2 cups beef broth. I think it made the flavor more robust. The soup was wonderful and very flavorful! This was good, but a little too sweet for me. The roasted veggies, especially the onions were so good though that I might just use this glaze for roasting squash and onions as a side dish! This is okay for a squash soup. It has a nice, savory flavor but it failed to impress my family of squash skeptics. I used a yellow pepper instead of red. I did use about half of the chipotle along with the adobo sauce and 1/4 of a large jalapeno. Wasn't very spicy but still good. I also used canned cannellini beans instead of the other beans she suggested and chicken broth for the liquid. I stirred my beans into the pot at the end instead of into the bowls since I was the only one eating and wanted the beans to be in the leftovers. Daughter and her family were supposed to eat with us but couldn't get up our hill because of all the leftover snow. I'll give her some of the leftovers. The toppings are delicious on this soup. I used Monterey Jack cheese, sour cream, tortilla chips, diced avocado, and some raw onion and pepper. I had a lime and forgot to squeeze on some of the juice. Wonderful soup for transitioning into spring. It was heartier than the potato-leek soup I make regularly but with a pop of freshness from the green vegetable. I used sugar snap peas, one of the suggested variations. Delicious light, yet filling soup. The turkey meatballs were exceptional - moist and very flavourful - and the broth was greatly enhanced by the soy sauce, vinegar, sesame oil etc added at serving time. My vegetables of choice were carrots and bok choy and I used the recommended substitute of basil for coriander. Nice change from plain pico de gallo. My printing of this book has corn in the picture, but no corn mentioned in the recipe. I'm guessing this is a mistake and it was fine without it. Served with tortilla chips. Made the chicken only. Worked with panko. This is a very quick method of breading. My cutlets took longer than 3 minutes on each side. I guess you have to pound them thinner. Served with her maple syrup bacon Brussels sprouts in this book and a balsamic arugula salad. Very tasty! I served it with the yummy sauce, reduced as directed. My chicken marinated overnight. Definitely a repeat recipe. Served with garlic mashed sweet potato and kale salad. This is very quick to make. My chicken breasts were larger than 5 oz, so I split them in half lengthwise. This dish was fine (not particularly exciting). I would make it again if I needed a quick chicken dish that could be made from things I have in the pantry. This was very easy and tasty, although it reminded me of something you might find at PF Changs. I used sake in place of white wine and used boneless, skinless thighs. Mine looked nothing like the photo in the book. I recommend cooking some rice with it as you will want something to sop up the sauce. This recipe was spectacular - everyone - my husband, 14-year-old son and myself - couldn't get enough. Mine sure didn't look as good as the picture in the book nor as good as Jenny's but it was delicious and a big hit. I used drumsticks instead of thighs and served them along with our other appetizers on Christmas Eve. My sister couldn't stop raving about them and even some of the picky eaters enjoyed them. Can't wait to try this again using thighs and also the pork she suggested using it on. Very good and simple dish. The sauce is to die for, and would taste good on many things. Definitely a repeat for me. My pork tenderloin was 150 after 25 minutes. Shorter time next time. Still a little pink and very tender. Family loved sauce. Very good, easy dish. The unexpected mix of ingredients (dijon mustard and sweet chile sauce?) sounded a little odd, but I trusted Dorie Greenspan to get it right, and she did - they merged into a tasty, savory, sauce that was hard to stop eating. Like Zosia, my pork tenderloin was overcooked at 30 min, despite still being a bit frozen when I started out, but was still very good. I would probably start checking the pork at 20 min if I made it again. Lots of flavour for very little effort. The sauce was more savoury than sweet and not quite as hot as I expected, both of which were positives in my family. The only issue I had was the cook time of the pork; my tenderloins were about 600g each, slightly larger than called for, but were more than done (155F) after only 30 minutes. Fortunately, they weren't dry, and even if they weren't as juicy as I prefer, there was the delicious sauce to help. This will be repeated, perhaps with chicken next time. I served it with cilantro-lime rice. This was a good combination of ingredients that cooked in the same length of time, all flavoured with delicious tangy dressing, aromatics and herbs. I used only 2tbsp olive oil and 2 tbsp balsamic vinegar and it was plenty. The flavors are wonderful in this easy, one-pan chicken dinner. I used drumsticks and they were done before the potatoes. DH liked dish a lot but said more mushrooms and garlic please. My son just transformed into a velociraptor, basically. When I say that he is tearing this up, I really mean he is TEARING IT UP. This is a kid who might have like a cheese stick and yogurt for dinner usually, but he's on his second chicken thigh right now. I can't really blame him, either. This is really, really delicious. Next time I'll add more mushrooms and onions, I think. And my son just asked for more chicken as I finished writing this, btw. So easy my husband could make it. Mild flavors and very satisfying. This is definitely a keeper. So simple and delicious. I made it exactly as written except we couldn't come up with whole chicken legs (odd) so we used bone-in, skin-on thighs. That was the only deviation from Dorie's recipe that we made. At 450 deg. F, our vegetables and chicken thighs were beautifully cooked and browned in 45 minutes and chicken registering 165-180 on the instant read thermometer. I couldn't be happier! Fabulous. The sauce was richly flavoured, just a little bit tangy and really delicious. I used only chicken thighs, some without skin, and they were done in only 30 minutes in my tagine. Most of the squash was cooked as well apart from the few pieces that were sitting on top. I rearranged things so the uncooked pieces were immersed in the liquid and cooked an additional 15 minutes. Fortunately, the chicken was still moist but I know now to check on things sooner and rearrange if necessary. The chicken came out nice and flavorful, but not sure if the butter really added that much. Tasted pretty similar to my usual roasted chicken. I do like the idea of roasting some bread in the same pot, that's genius. My first recipe from Everyday Dorie. So moist and delicious. My chicken was almost 6 1/2 pounds but was the smallest one I could find at my local market. I cooked for about an hour and half and it turned out perfect. My family and I almost devoured it. We really enjoyed this. The honey and chipotle flavors were a new flavor combination in chili for me...so good. I'd never had tamale pie before and thought it was a really fun dish and kids will love it. I added pepper jack cheese to the cornbread and cooked the chili in a large cast iron pan then put the batter directly on top of it. The spiced paste was delicious and applying most of it to the chicken under the skin meant that flavour wasn't thrown away with the skin for those who don't eat it. I replaced the butter with 2 tbsp olive oil and added minced garlic (rather than roasting a whole head of it). Both chicken and pan juices were very good. Excellent moist and flavourful burgers. They didn't have as much of an Asian flavour as I expected based on the ingredients, just a rich meaty flavour, and if you chop the mushrooms a little more finely than suggested, they aren't noticeable. (Child who dislikes the texture of cooked mushrooms had no issue with them in these burgers). I pan-fried them this time but they'll definitely be made again when grilling season starts. Oh my, thank you Dorie for this wonderful recipe! I made these tonight and they were just awesome. Well, actually I did the prep last night, cooking the mushrooms and onions, forming the patties (we used bison), and tonight I grilled them. So delicious, moist, with a great blend of Asian flavors. We’ll have these again soon. This is very flavorful, no real heat. Marinated a flank steak for 8 hours, then grilled. Nice balance, salty/spice. Fabulous dry rub recipe. I was a bit skeptical about the unusual mix of spices, but I've had good luck with Dorie Greenspan's recipes, and it worked, producing a warm, faintly sweet coating on the steak. I used ancho chile powder for the "chile powder" - ground chipotle might be interesting to try. I made this with a strip steak and I found that the spice rub was just too strong for the beef and overwhelmed it. The sugar in the dry rub also burns easily so it's hard to cook the steak to an appropriate doneness without burning. There certainly was a lot going on in this rub, not all of which I liked. It helped produce a good crust on the steaks but the flavour, dominated by five spice and cinnamon, was a bit of a surprise. I should have read the reviews before making it. A great meal on a late fall night. I cooked mine on Sat when I had more time and reheated on Sunday. I did add some parsnips to mine as suggested in the Carbonnade note after the recipe. Instead of noodles I served mine with yeast rolls. Son said it was the best beef stew I'd ever made but would have liked some potatoes in it. Daughter said good but she would have enjoyed it over mashed potatoes and likes an Irish stew we make a little better. Son in law said delicious but he too likes the Irish Stew and also Christy Jordan's tomato-less beef stews just a little better. But all said they would eat it again. Hubby said he would eat some later. I did forget to get some fresh herbs and I think that would have been a great addition. I did use the dark Chimay Ale suggested by Dorie. Son was happy to drink what was left. This was great! I added some carrots and parsnips, per the note in the recipe, and I would add them again. We served it with mashed potatoes, and it was the perfect dinner for a cold and snowy February day (even though I forgot to add the herbs at the end). The onions took about twice as long to caramelize as the recipe suggests, but it was worth the time, as they add a nice complex flavor as they dissolve into the sauce. I have made at least 2 other versions of this style of stew......husband liked but certainly didn't rave about either. However, this one we both loved! Others have sometimes been.....gummy, but this produced a beautiful silky full flavored sauce and tender beef. I stayed true to the original with no extra veg but I did use Newcastle brown ale (always a can in the fridge waiting for many recipes....add this one to that list). I served it over wide egg noodles and it is a DEFINITE make again! I have made beef carbonnade from another cookbook. It doesn't compare to this one. The sauce is a very rich brown with a sweet and sour taste. The cider vinegar and brown sugar does it. The caramelized onions completely disintegrated. Left my meat chunks on the larger size. It was ready in 2 1/2 hrs. A repeat. This is maybe the best thing I have ever made. So delicious!! I added sliced mushrooms in the last 30 minutes of cooking. Amazing!! A bit of a pain to make, but it was really really good. Delicious!.....will definitely repeat...followed recipe as written. Quite good, and more interesting than your standard spaghetti and meatballs. The sauce is pretty simple, not a typical thick tomato sauce, and therefore you really notice the flavor of the meatballs. We used thyme and rosemary in the meatballs, and the rosemary added a very nice flavor. It would have been better with the optional fresh herb garnish when serving, but I forgot about it until too late. While this was very good we thought the sauce lacked flavor. Balsamic vinegar, sugar, salt, pepper, and garlic just wasn't enough for us with the tomatoes. We thought it needed some herbs. We added some fresh basil in our serving bowls. We also added some Parmesan. The meat balls were interesting with the addition of walnuts, and they did have herbs. I used fresh basil and thyme and dried oregano. I did omit the rosemary since son doesn't care for it. I used my meatball scoop and got 29 meatballs. This was still a very good supper and I'd make it again with some additions. I was intrigued by all the interesting spices and veg in this, but the results were just kind of “meh” for me. I have shepherds pie recipes that I like better, I’m afraid. Very acidic, next time I will reduce the lemon to 1/2 and the vinegar to 1 TBL. Reduced the honey by 1 TBL. Quick and easy, will repeat again with the mods on a weeknight. Served with roasted sweet potato/mushroom/pepper medley over a bed of spinach and the flavors were quite complementary. Yes it's delicious. Roasted pork loin to 135f. The onions and apples caramelized beautifully. A repeat. Turned out quite good. I’m wary of pork loin roasts (dry) and my local butcher couldn’t get me one in time so Whole Foods it was. The rub was more like a marinade so I let it soak in a ziplock to keep everything close. I also trussed the pork to keep a nice rounder shape. Not much in the way of pan juices but the apples and onions were delicious. They just became quite thick together. Would definitely make again. Tangy and bright tasting. They were so flavourful, we didn't think they needed any topping. Simple and delicious salmon recipe. I appreciate her instructions for using the instant-read thermometer. Really simple and delicious. Made the miso jam sweet potatoes and the maple mustard brussels sprouts to go with it. Simple but very flavourful. It was an excellent choice for a busy weeknight as the parcels were assembled well in advance, had a very quick cook time and there was virtually no clean-up. I served this with good crusty bread to sop up the delicious sauce (and steamed broccoli). This was a hit. The pineapple-peach salsa drew me to this recipe (the other elements seemed fairly standard) and it did not disappoint. It was sweet and tangy and just a little bit hot, though that, along with the heat level of all of the elements, was easily adjusted to taste. I made the fish variation seasoned with Old Bay, and substituted green onions for red in the salsa but otherwise followed the recipes. nice variation - swap out sardines for smoked salmon. Skip the tomatoes. Another variation - swap out sardines for tinned tuna. Delicious, and easy to put together. Very fresh and light, and really lemony. Did I mention that it’s really lemony? I didn’t follow the recipe exactly, but I loved the flavor. I don’t normally use Dijon for Brussels sprouts, but it worked well. I just roasted them in the sauce, without bacon because I didn’t have any. Will definitely make again. This was on my Christmas menu. Absolutely delicious. I didn’t hold back on the bacon. A touch of vinegar really brought all of the flavours together. This was a delicious recipe. I used maple syrup and the cider vinegar isn't to be missed. It just gives it that touch of acidity. Will make it to go with Christmas dinner. Loved the flavours in this. I served them over a kale salad dressed with a sharp vinaigrette as suggested as our main and would do so again. If I were to serve it as a side, I would use only half the bacon to lighten it a little. Also, my sprouts were done after only 6 minutes of steaming. Since they were cooked again, albeit briefly, I would have liked to have caught them when they just under....I'll try 5 minutes next time. Made this as a Thanksgiving side. I chose the option to substitute balsamic vinegar for the maple syrup. While it was good I think next time I'd do half maple and half balsamic as it was a little tart. Hubby loved them though. I steamed the sprouts in the instant pot before continuing with the recipe and cooked them a little more than I meant to but they were still good. I found these to be okay. They definitely were not good enough for the amount of steps required to make them. I didn't feel that the maple syrup or the mustard really provided much flavor to the Brussels sprouts and the bacon just seemed too much. Enjoyed this a lot. Easy but time consuming to put together & bake. Reheated the next day well. These were so good! Served it with the miso salmon. Will definitely make again. Would be good for a dinner party, too. The jam was good, but the miso I used must have been a lot more pungent. Next time I will use less. Also this "jam" would be good on roasted carrots. Geezer who once was a chemo kid & still struggling to learn to embrace the "calabazas" (pumpkin & orange winter squashes). Still don't love them but this is the first recipe that does not use a strong cheese (e.g. feta) to offset the, what is for me, nauseating sweetness. This time the trick is the sourness in pomegranate molasses. I will make again because I am determined to become a better seasonal eater in the winter where my learned food aversion has long ruled out all those beautiful to the eye squash/pumpkins at the store. Not necessarily the greatest of endorsements (i.e. it did not make me remember all the vomiting) but, I believe, indicative of its strength - the recipe plays against the straight forward sweetness of a winter squash, which created a better taste sensation for me. It will be easy to commit to a pocket type of preparation (simple ratios overall) which means, for me, I can probably stop looking for other acorn squash recipes. Thank you Dorie! Wow. I was skeptical at first and thought the dish would be too bland: all it is is veggies, salt, and olive oil. But I was generous on both salt and oil and the result is an instant favorite. The veggies end up super flavorful, jammy, caramelized. Will be making this over and over again. Super easy to put together too! This was great! It was the perfect comfort food on a cold and snowy day. I hadn't made a bread pudding in a water bath before, and it had a nicer texture than other bread puddings I've made. I made it with the optional pancetta, and I would definitely use it again. Reheated leftovers were quite good. We really liked this. I followed the recipe as written but added tofu (optional ingredient) roasted in the same ponzu-gochujang mixture that flavoured the rice instead of uncooked. The trick of adding a little water to "unstick" the rice worked well. I'll definitely make this again. I used three heaping tablespoons of finely chopped ginger and had no regrets. Also used all chopped Napa cabbage and no bok Choy as I didn’t have any of the latter. Otherwise, I followed the recipe. I used more oil than I care to admit but the veg and crunchy rice bits were divine - just kept scraping it off the fry pan. My family loved this recipe. I should have made more because they were squabbling over the last spoonful. My family liked this. I put two tablespoons of ginger in because we like it. I also added tofu. Otherwise, I followed the recipe as written but I will note that it took much longer to char the veggies than the recipe suggests- more like 15 minutes! Going to put this at the top of the "best chocolate chip cookies " list. Addition of oatmeal makes them wonderfully chewy. Love the addition of oatmeal. We all enjoyed this version of chocolate chip cookies. I did use bagged semi-sweet chocolate chips since that's what I had on hand. I'm sure they'd be even better with the good chocolate Dorie suggests. I left some without the chocolate glaze. I used semi-sweet instead of milk chocolate. I liked the ones with the chocolate best. Very good with a cup of hot tea or coffee. This is delicious! I used unsweetened coconut flakes and skipped the icing because I don't like overly sweet cakes. This cake is wonderful. Lovely flavor and texture. Light, simple, and very tasty. Recipe calls for it to bake for 55 to 60 minutes, but I checked it at 45 and it was done. This will be a regular for us in blueberry season. Very nice, simple cake that was quick to put together. I really liked the addition of cornmeal. My cake sank a little in the middle (but we had no problem finishing it); I live at 5000 ft and did not make high altitude adjustments, but I think it would be worth doing if you're making the recipe at a higher altitude. Recipe made a fairly moist, sweet cornbread. I divided it into 3 smaller loaf pans (about 2.5 x 5 in bottoms) & took about 30 minutes to bake. This is a variation of the cornmeal buttermilk loaf cake (with or without berries) that bakes in half the time in a skillet (only 28 minutes in a 12" pan). My blueberries were exceptionally sweet so I found this to be too sweet but family enjoyed it - good return for the small amount of effort that went into it. I baked this with walnuts, and added nutmeg and ground ginger. Substituted 1/2 c whole milk buttermilk for 1/2 c oil because I had it on hand and added 1/4 t additional baking soda because of the buttermilk sub (to make less acidic). Looks great! Fabulous dessert! It was sweet and tart, creamy and crunchy and not particularly heavy, which is nice at the end of a big meal. I did cheat a little by using homemade cranberry sauce leftover from Thanksgiving and lime curd that I'd made for an upcoming cake. I did make the meringue which, simple though it was, I managed to over bake. It wasn't as pretty but it was still delicious. Great chocolate pudding recipe, but probably better for the adult crowd than for kids. My husband and I loved it, but my 7-yr-old wasn't a huge fan since it leans toward the not-so-sweet side of chocolate desserts. He only ate the bites with the chocolate crunch topping (which I highly recommend making to go with the pudding). The recipe asks for firm pears, but I think mine were too green (I guess that’s what happens when it’s off-season). The flavors were nice but I wanted the pears to be softer. A nice mild dressing. I didn't have white wine vinegar so used white vermouth. This could be my every day dressing. I like the two vinegars, and the ratio of oil to vinegar. I have few recipes that call for white balsamic vinegar so it's nice to find a good basic one like this that will be made often. This stuff is great! I made it to go with the chocolate pudding recipe in the book, and they were the perfect accompaniment. I gave them a couple of extra minutes in the oven since they still seemed really soft, but they crisped up as they cooled. We've also had them over ice cream and were equally good there. This recipe also appears in Baking Chez Moi and I have made it many times. It comes together quickly in a food processor and always turns out well. I reduce the sugar to 1 tbsp for savoury galette fillings. The recipes here make everyday cooking relaxing and pleasurable, not to mention surprising and fun. This is the kind of comfort food that I want to cook and eat now—and all the time. 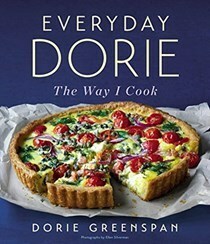 Dorie has long been a go-to for me in the kitchen when it comes to baking. Her recipes are SPOT on and now we get a peek into the everyday recipes she makes! ...she invites us into her kitchen to share what she's been cooking. The meals feel familiar and approachable and like feasible options for weekly meal planning. Dorie Greenspan's latest shares 175 recipes that are her favorites and will undoubtedly become ours as well. She's known for spicing up tired classics by mixing in surprise ingredients to make them feel a lot more special and make the expected unexpected. Perfumed with orange and honey notes, and slathered with the optional but highly recommended chocolate glaze, they were a perfect afternoon pick-me-up, best enjoyed with a cup of tea. This is a fabulous, spur-of-the-moment, enjoy-it-anytime cake—no stand mixer or softening of butter required. In fact, I made another one the next day for my family to enjoy. ...is a traditional French dish, but Dorie’s version features Portuguese flavors, including smoked paprika, white beans, and a zesty balsamic vinaigrette. It was delicious. This soup was one of my family’s favorite dishes from the book—it's light and elegant, made with lettuce, alliums, herbs, and broth, with just a pat of butter to add creaminess. Generous amounts of fresh herbs mingle with a simple balsamic vinaigrette, which cooks down and gives the chicken a crispy dark sheen, and also adds sweet notes to the entire dish. The resulting mixture is part dip, part condiment. You can serve it with crackers or crostini for a snack or appetizer, but my favorite way to use it is as a condiment.